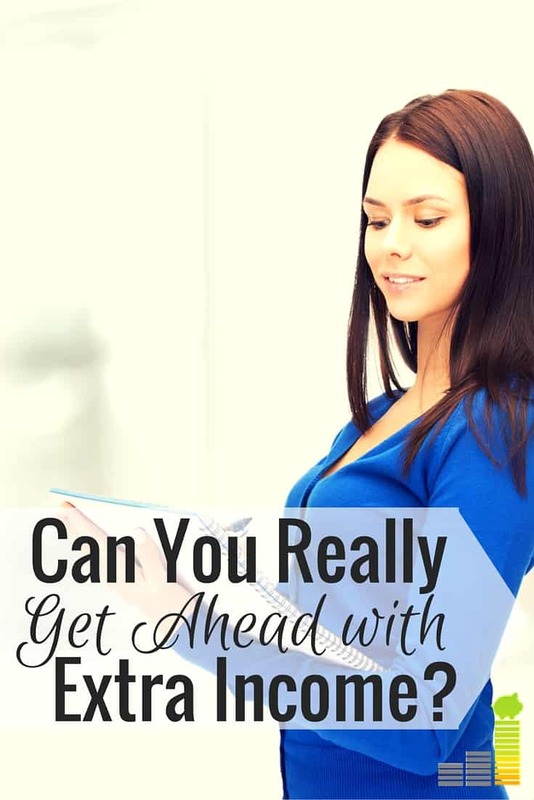 Can You Really Get Ahead with Extra Income? While I’m moving this week, please enjoy this contribution from Latoya at Life And A Budget. If you’d like to contribute to Frugal Rules, please contact us. Regardless of the amount of income we make, it’s common knowledge Americans save very little. Venture to almost any personal finance site and you could easily find statistics that convey around 62 percent of Americans have under $1,000 in savings. If you can’t manage to save, no matter how much extra income you make, the big question for me is: how will you ever get ahead? Extra income each month isn’t hard to come by for some of us. You have Larry who will pick up additional shifts each week at work and then there’s Pam who sells baked goods to her co-workers to make extra money. Opportunities to make extra income are abundant. The question is — would Larry or Pam actually get ahead with their extra income? I believe there are three factors that determine whether this would be possible. Let’s explore them to see if they have the juice to make extra income work for them. Face it, if Larry is going to take his extra money to play poker this weekend, he’s not going to get ahead. Neither will Pam if she’s selling apple pies to keep her manicure and pedicure fresh. Your behaviors toward money will determine your financial situation. Bad habits, wasteful spending and living beyond your means is not a recipe for good financial health. If you’re making additional income, make sure your money continues to work for you long after you receive the paycheck. Let’s use tax season as an example. The average tax refund is north of $3,000. Instead of squandering it away on a new television or a down payment for an unneeded car, use this lump sum to pay off debt, save or invest in the stock market. Let’s talk about Larry again. He loves playing poker with his friends and he works hard all week. Larry thinks he should play all weekend to make up for his hard work during the week. The only problem with Larry is he’s behind on his mortgage. He believes all he needs is one lucky win and he’ll be able to get caught up on his bills. What’s wrong with Larry’s mindset? First, he thinks he’s entitled to treat himself because he works hard. Second, he believes luck would solve his financial problems. Regardless of the scenario, entitlement and wishful (delusional) thinking isn’t doing him any favors. If he won’t properly manage the income he has, a lucky break won’t change his mindset. Pam can’t see beyond going to the nail salon each week with her extra income. Her debt is spread across seven credit cards totaling $4,000. Each month Pam tells her mom, “If I made an extra $300 monthly at work I’d be able to get ahead.” The problem is she makes an extra $200 a month selling her baked goods. Instead of using this income to attack debt, she uses it for a manicure, pedicure and an occasional outfit. Her strategy: look good and get a promotion. Depending on her job, this strategy could pay off in the end. Unfortunately, her debt doesn’t care. The interest continues to grow on her unpaid balance. What her strategy should include is a plan to address her debt that doesn’t involve spending her additional income. Pam should consider the long-term implications of her plan to improve her money outlook. Doing that can be difficult. But, knowing where to start is made easier with free online tools like Personal Capital that can help Pam (and you) manage your income or cash flow, helping you achieve your financial goals. It’s obvious Pam and Larry have some hurdles to overcome if they want to get ahead with their extra money. Unfortunately, many real folks like you and I face the same dilemmas everyday. Sometimes the extra cash comes, but it slips out of our hands before we do anything constructive with it. The good news is something can be done about it. If you are paid bi-weekly and budget accordingly, think about your behaviors when you receive that extra paycheck twice a year. Do you immediately create a plan to spend the money before you have it? If you receive a tax refund each year, consider your money mindset. Do you feel entitled to give yourself a break because of all the hard work you put in through the year? Last, consider your money outlook. Have you made any long-term plans? Could this extra paycheck or tax refund be contributed towards emergency savings? If you want to make progress financially, remember your money behaviors, mindset and outlook all play an important role in determining whether you actually get ahead. The next time a little additional change jingles in your pocket, make that extra money count for something. 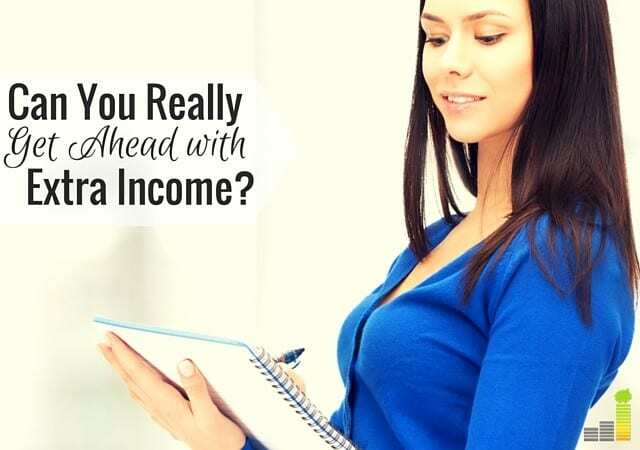 Do you believe it’s possible to get ahead with extra income? How do you determine to use extra money earned from side hustles? What, in your opinion, is the best way to help change money behaviors? Latoya is a writer for hire who loves talking about budgets and money. Her mission includes paying off $79,000 in student loans and living to tell about it. She’s a full-time, work-at-home mama who shares her journey over at Life and A Budget. Totally agree, Latoya! I’ve caught myself giving to the temptations of lifestyle inflation with my side hustle money. Lyft rides or ordering delivery really adds up. So I’ve deleted those apps from my phone to avoid it completely! Last month I got an itch to treat myself and bought 2 keyboards to type faster with. It caused me to go over budget in a category. I love them but did I really need them? Thanks this article got me thinking. That’s an awesome point, Lindsay. All of my freelance income sits in my PayPal account until I’m ready to split out the taxes and expenses. Then I transfer it to my account for big ole student loan payment. It stays totally separate from my expense account and discretionary spending accounts so it’s actually like it’s non-existent to me. We all have to master that art of self discipline and being aware of our weaknesses allows us to take extraordinary measures to protect our side hustle income. I’ve taken both mindsets and found time and time again that the best use for side hustle money like this is either to pay down debt or to invest. Otherwise I tend to fritter it away on unnecessary expenses I tell myself I “deserve” because of all the extra work I’ve been doing. Understandable, definitely understandable. If we recognize those weaknesses though we can do something about them and it looks like you’ve got a handle on things. Well I would kind of be a hypocrite if I said you CAN’T get ahead by making more money so…yes you absolutely can. I like that you pointed out some examples of how you need to be in the right mindset or the extra money won’t make a difference. This is very true and a big reason I think people should focus on cutting expenses at first. Lol, so true David. Yeah there’s definitely more involved than just making the extra income. I definitely think extra money can help you get ahead…if you use it the right away. Far too many people work overtime or multiple jobs, only to waste their extra money and not make it count. I think that is the one problem of working till burnout. Sure you’re making extra cash, but then you are so tired, sick, tense, etc. that you run the risk of spending it on “I deserve it.” items. Hey Tonya, this is so true and one that I constantly battle with…and it’s not the deserve aspect either. It’s just the fact that I’m too tired to do anything else…that includes cooking! So there is a delicate balance. If you use the money in the correct way, extra money can most certainly get you ahead. I have had 4 pay rises in the last 18 months, until Christmas I still just about scraped to the next pay day and I was earning £10k more! I took stock of my finances, really cut down on waste and hey presto there was £700 spare that could be saved. I now have a savings/current account for each thing I’m saving for to keep me focused on the end game. Happy to say I’m way over target for my initial challenge of saving £5k in a year, even though I had a slip this month! Thank you. Way to go on your progress! Love this one! I used to spend too much on a salon too, but now I preferred to DIY especially on my nails. Hey Clarisse, I figured many of us ladies could relate to that example. I used to be in and out of the salon for pedicures too. Now I only go about twice a year and maintain them in between myself. An increase in income can be accompanied by lifestyle inflation to match it. Great points! It’s so important to make a plan for that extra income if it’s going to make a difference. I like the strategy of motivating extra work/earning with what you REALLY want to spend the money on. Those who are sold out on debt repayment or investing will find it easy to do the responsible thing with their extra income. But for people who want to have manicures or whatnot, I’d say they should build the responsible behaviors into their budget based on their main income and use the side income for the fun luxuries. That way they will keep earning the side income and perhaps even find a way to earn more, all while meeting their main financial goals on a consistent basis. I used a version of this in my own budget for a long time. We saved in our typical budget, but put all the leftover money at the end of each month into a savings account designated for travel. This helped motivate us to practice frugality each month to increase the amount of leftovers we had to work with. This is a good strategy and I really hadn’t thought of it that way before. Thanks for sharing your insight! Excellent post. I think you have to first “diagnose” whether you have an income problem or a spending problem. If you have a spending problem, then no amount of side hustle money will do. But if you legitimately have an income problem, then side hustles and extra income help tremendously. No matter what you have to know how to manage your money – the money that you have. But you also may need to make more money to meet your living standard (I’m a good example of that with massive student loan debt from law school). Me too, girl! I can definitely relate! And yes, that is very true…diagnosing individual issues is essential. The reason why this topic came to mind is because I witness a lot of people day to day who always wish they had extra income and I know from experience that this wouldn’t solve their problems. I believe 100% that extra income can get you ahead. Since I’ve started side hustling I’ve been able to get current on every bill and pay off some debt. Without the extra money I would be struggling. Yeah, it depends on the person and given you have a goal for your side hustle income it is definitely making a difference in helping you get ahead. Not everyone is able to carry this out effectively if they have spending problems in general. Yes! But unless there are clear and concise plans for that money, it’s all going down the drain. There have been times where an extra shift at work turned into one nice dinner, which obviously wasn’t the intention. But those few extra dollars do add up quick to extra payments. Yes, I can definitely relate!